I joined in April 2017 as a technical support apprentice. 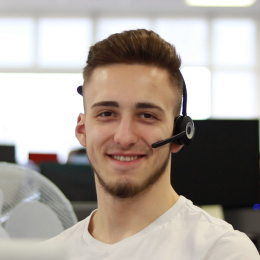 After completing my apprenticeship with iHASCO, I am now a Technical Support Assistant. I do what any good IT guy does – turns it off and on again! I also support clients with any technical issues or queries they may have. Much like any young boy, my dream was to be a professional footballer! What do you get up to when you're not at iHASCO? Staying active is important to me and I love playing football, tennis or any other sport that I can try. I’m also addicted to lifting heavy objects! Other than that, watching TV shows with my dog is also fun. Choosing my favourite would be impossible, I love any food but probably Borscht (a type of soup from Latvia) and cheesecake is definitely up there. I’ve always wanted to visit various cities in the U.S, New York and Los Angeles to name a few! Monty Python’s Life of Brian. Old but gold! I’m left footed but right handed and I was once ranked 6th in the county at tennis.